This was unquestionably one of the biggest and most successful tricks known to history — that is, if it’s true. Homer mentions the occurrence in “The Iliad,” and Virgil extrapolates the story in “The Aeneid.” Evidence suggests that Troy itself existed, giving some validity to Homer’s tales, and scholars have long been investigating how historically accurate these details are. One theory behind the Trojan horse comes from historian Michael Wood, who proposes that it was merely a battering ram in the shape of a horse that infiltrated the city . However, van Meegeren, who was working in the 1930s and ’40s, made one major mistake. He sold a painting to a prominent member of the Nazi party in Germany. After the war, Allies considered him a conspirator for selling a “national treasure” to the enemy . In a curious change of events, van Meegeren had to paint for his freedom. In order to help prove that the painting was no national treasure, he forged another in the presence of authorities. When Bernie Madoff admitted that his investment firm was “just one big lie,” it was an understatement . In 2008, he confessed to having conned about $50 billion from investors who trusted him with their savings. Madoff used the f­ormula of a Ponzi scheme to keep up the fraud for more than a decade. Although a few relatives and acquaintances who’d known Anastasia believed Anderson, most didn’t. By 1927, an alleged former roommate of Anderson claimed that her name was Franziska Schanzkowska, not Anna and certainly not Anastasia . This didn’t stop Anderson from indulging in celebrity and attempting to cash in on a royal inheritance. She ultimately lost her case in the legal proceedings that dragged on for decades, but she stuck to her story until her death in 1984. Years later, upon the discovery of what proved to be the remains of the royal family, DNA tests confirmed her to be a fake. In 2009, experts were able to finally confirm that all remains have been found and that no family member escaped execution in 1918 . Raised Protestant by an Anabaptist preacher, Oates entered Cambridge as a young man to study for Anglican orders. After misconduct got him dismissed from his Anglican post, he started associating with Catholic circles and feigned conversion . With the encouragement of fellow anti-Catholic Israel Tonge, Oates infiltrated enemy territory by entering a Catholic seminary. In fact, he entered two seminaries — both of which expelled him. But it hardly mattered. By this time, he had gathered enough inside information and names to wreak enormous havoc. In 1678, Oates concocted and pretended to uncover a plot in which the Jesuits were planning to murder King Charles II. The idea was that they wanted to replace Charles with his Catholic brother, James. What ensued was a three-year panic that fueled anti-Catholic sentiment and resulted in the executions of about 35 people . In response to mounting suspicions, Nixon denied allegations that he knew anything and proclaimed, “I am not a crook.” This lie came back to haunt him. When it was revealed that private White House conversations about the matter were recorded, the investigative committee subpoenaed the tapes. Nixon’s refusal on the basis of “executive privilege” brought the matter to the U.S. Supreme Court, which ruled that he had to relinquish the tapes. To accomplish this, Adolf Hitler and his minister of propaganda, Joseph Goebbels, launched a massive campaign to convince the German people that the Jews were their enemies. Having taken over the press, they spread lies blaming Jews for all of Germany’s problems, including the loss of World War I. One outrageous lie dating back to the Middle Ages claimed that Jews engaged in the ritual killings of Christian children and used their blood in the unleavened bread eaten at Passover . Using Jews as the scapegoat, Hitler and his cronies orchestrated what they called “the big lie.” This theory states that no matter how big the lie is (or more precisely, because it’s so big), people will believe it if you repeat it enough. 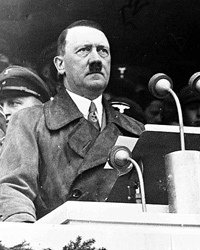 Everyone tells small lies, Hitler reasoned, but few have the guts to tell colossal lies . Because a big lie is so unlikely, people will come to accept it.